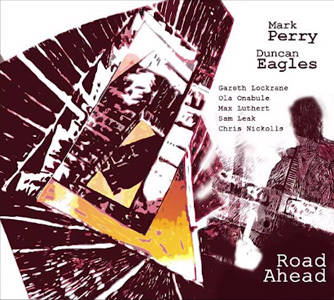 GREAT TO FIND this big league seven-piece from London’s flourishing contemporary jazz scene recording together, presenting a set of ten colourful, original compositions (first aired at 2012’s London Jazz Festival) by leaders Mark Perry and Duncan Eagles. Having already established themselves as versatile instrumentalists in a variety of ensembles and projects, trumpeter Perry and tenorist Eagles bring together an accomplished ensemble who, together, produce a satisfyingly full sound – Gareth Lockrane on flutes, Sam Leak at the piano, double bassist Max Luthert and drummer Chris Nickolls, plus the wordless vocals of Ona Onabule. Flip of a Coin provides the heads-up on the intent of this quintet line-up, Sam Leak the pacemaker with a determined piano rhythm, Luthert and Nickolls maintaining the steady but solid energy. Onabule’s vocals enhance the sustained frontline of trumpet and tenor before Perry and Eagles head off to solo spiritedly. Mark Perry’s delivery is undubitably incisive, complemented by Eagles’ rich and fluid explorations – certainly an in-form partnership. In the upbeat Chord Game, Sam Leak demonstrates the clear, spacial and considered piano technique which makes his own album recordings so appealing; and Perry and Eagles freely bounce ideas off each other. Easy-going Shawty and the still mellower Forever make good use of Onabule’s soulful voice, Eagles’ solo tenor in the latter just sublime. Barters Band raises a smile, Gareth Lockrane’s lithe flute the key to its chirpy ’70s sitcom’ flavour – the rhythm section ticks along amiably, a great foundation for Leak’s clean solo lines and fleetly-placed chords, whilst Perry and Eagles dance closely to Lockrane’s tune. The tempered, late-night feel of Wray Common is perfect for Onabule’s subtle vocal additions, Luthert’s lyrical yet precise bass pairing well with Leak’s pianistic clarity, and trumpet and sax soporifically intertwining. In contrast, the agitated G.T. (a tribute to American saxophonist Gary Thomas) finds Eagles and Perry soloing grittily against a mysterious piano, bass and drums riff (great animation from Chris Nickolls) which offers more than a hint of ‘TV detective’! Perry’s expressive, plaintive solo trumpet opens mid-tempo title track Road Ahead which affords Sam Leak the freedom to roam (and rather elegantly at that). One Last Kiss is beautifully poised, Lockrane and Onabule again adding their individual character to this very attractive, breezy number. With an element of emotional longing, and drawing this entertaining album to a close, Remember features softer, slurred tones from Mark Perry, velvety bass flute from Gareth Lockrane, and fine ensemble playing all round. Launching ‘Road Ahead’ at Pizza Express Jazz Club, London, on 17th November (as part of the 2013 London Jazz Festival), and releasing 2nd December, the quintet are set to tour in Spring 2014. Promo video, SoundCloud samples and more information here.